One of the very first decision you're going to have to make when you take home your new Shiba Inu puppy is what kind of collar and / or harness to use. Gone are the days of simply attaching a collar to a lead- there are so many options! From harnesses with padding to personalized leather collars, the choices seem endless. While you may be tempted to succumb to vanity, there is a more to take into consideration than fashion when it comes to choosing accessories for your Shiba Inu pup. Safety, comfort and durability are the three key words of choosing how you'll lead your Shiba Inu puppy on their daily walks. While each Shiba Inu pup is different, there are a few important things to take into consideration, starting with whether or not to get a harness or a collar. Collar or Harness: Which Is Best for Shiba Inu Pups? Thankfully, this part of the decision process is pretty easy. While many Shiba Inu owners opt to buy a collar for their Shiba (mostly for identification purposes, as it's very easy to attach an ID tag to a collar), harnesses are safer and more comfortable for walking. While it's a good idea to have a collar just in case your Shiba Inu were to get lost, you should buy a harness to attach to their leash for walks. Not only are harnesses more comfortable (they eliminate the "pulling" sensation your Shiba may experience until they learn to walk politely on the lead) they are also much safer. Shiba Inu puppies have very delicate necks, and any sort of jerking motion, even an accidental one, could cause them injury. If you attach their leash to a collar that fits around their neck, you are potentially exposing them to tracheal injury and sprained neck muscles. Even if you walk your Shiba Inu very gently, you may suddenly need to pull them back or restrain them, which could lead to a neck injury. A harness, which attaches around your dog's shoulder blades and back, is much sturdier, allows for better control, and reduces your Shiba Inu's risk of injury should you need to pull on their leash. There are hundreds of different harness models on the market, from simple nylon ones to fancy harnesses with padding and bells and whistles. 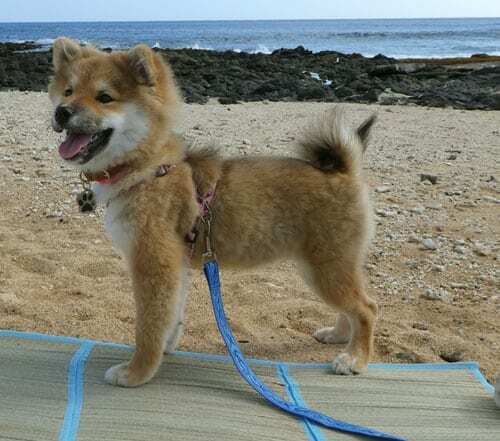 The truth is that your Shiba Inu puppy will grow very rapidly, so it’s not worth spending a ton of money for the harness they will use during puppyhood. 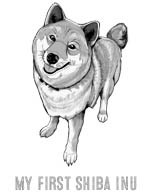 Your best bet is to purchase a harness that is highly adjustable, which ensures that you’ll be able to use it even as your Shiba Inu puppy grows (though you may need to purchase another harness when they are full grown). It’s also worth it to purchase a harness that is relatively easy to get on and off. Our favorite type is the "step-in" type of back harness. 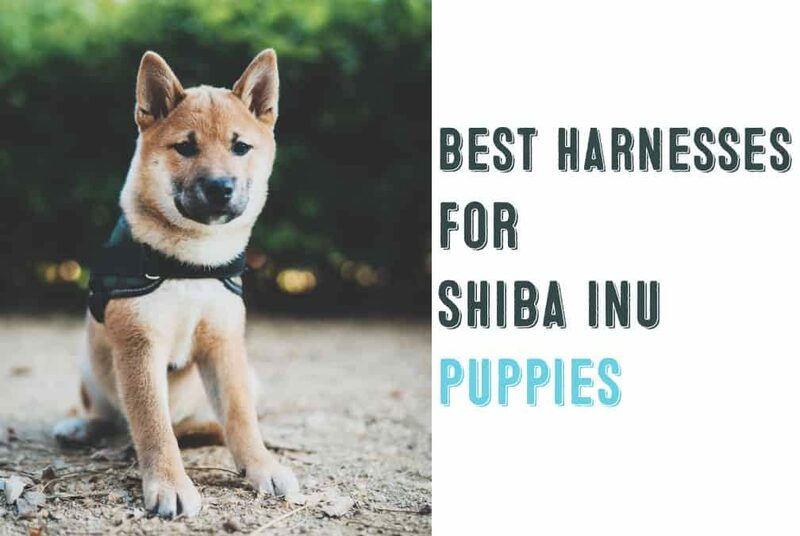 Your Shiba Inu pup might not love wearing the harness initially, especially during the early months, so you’ll want something that’s quick and easy to put on. A great option is the Pupteck basic harness, which has a simple clasp that makes taking the harness on and off a breeze. The type of harness is considered the earlier mentioned "step-in" type of harness that quickly growing in popularity for it's ease of use. You can put this model on feet first, without ever having to wrap anything around your Shiba Inu’s neck. If your Shiba Inu puppy enjoys pulling you around the block, you might also consider the The Original EcoBark Control Dog Harness or the Yuppie Puppy Harness, which are great puppy harnesses specially created to discourage pulling. 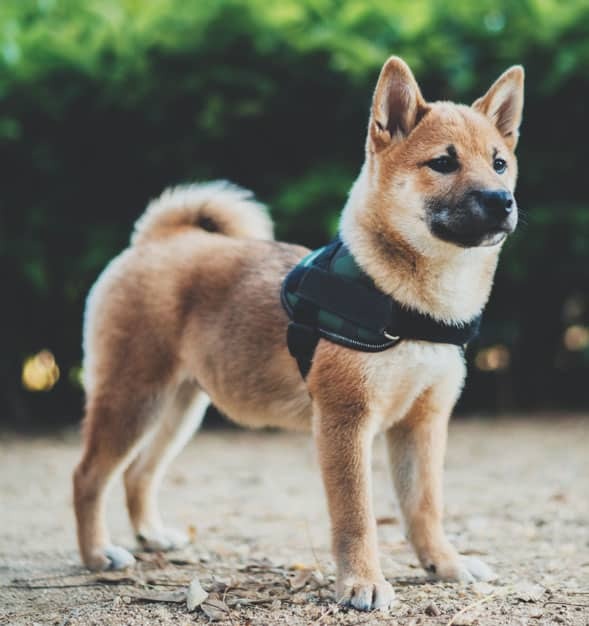 While most harnesses have the ring where the leash attaches on the dogs back, some harnesses have the ring in the front (on your Shiba Inu’s chest), which can be helpful for dogs that need to learn how to walk politely on the leash. It’s a good idea to bring your Shiba Inu puppy with you when you go harness shopping. Not only will it allow you to choose the correct size (you can usually try them on in the pet store), but you can also gauge their reaction to the various styles. If the harness is uncomfortable, feels restrictive, or doesn’t fit right, you may find yourself battling your Shiba Inu every time it’s time to go for a walk. Do yourself a favor and invest in a harness that is safe and comfortable. With a little practice, putting on your Shiba Inus harness will quickly become second nature. While it may take you a few times to get in right in the beginning most harnesses are simple enough to use and you’ll quickly get the hang of it. 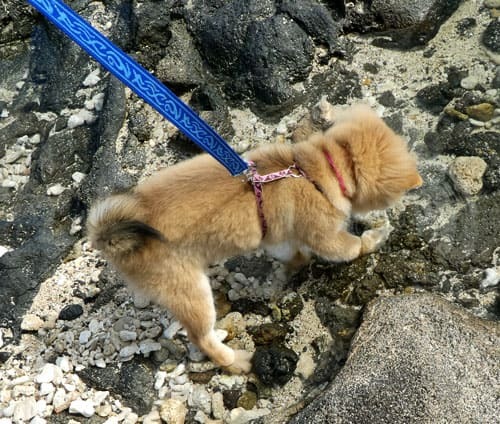 Identify whether or not the harness goes around your dog’s neck or if you need to stick their feet through it first. This is the first step in figuring out the easiest way to put on the harness. Also take a look to see where the leash ring should be. Does it go in the back or in the front? Practice. After a few try's you'll quickly catch on. If your Shiba Inu puppy is initially reluctant to wear the harness, make sure you keep the mood light and positive. Once the harness is on, distract the pup with play, affection or food. The longer they wear it the more comfortable they'll be. Using treats as a reward the first few times you put on the harness is a great idea. Offering them treats and plenty of praise is the best way to ensure that your Shiba Inu puppy associates the harness with positive things. To avoid a negative experience, avoid putting on a harness for the first time right before going to the vet. At the end of the day a harness is safer and more comfortable for your Shiba Inu puppy. While it’s a good idea to use a collar for identification purposes, you should attach your Shiba Inu’s leash to a harness rather than a collar. Not only do harnesses give you better range of control during walks, they are also less likely to inadvertently cause injury. Because Shiba Inu puppies - and all puppies in general - have such delicate necks, even accidentally tugging on a leash attached to a collar could cause injury. Do yourself a favor and invest in a quality yet moderately priced harness for your Shiba Inu pup. It will make walks much more pleasant and safe for the both of you!